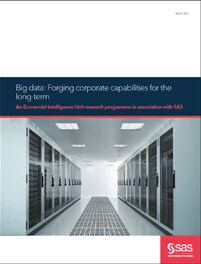 A SAS research programme based on a survey conducted by The Economist Intelligence Unit. This report by SAS based on a survey by the Economist Intelligence Unit looks at how organisations in the UK and across the world are now using data, and how this has moved on since 2011 with some significant shifts taking place. There are significant findings showing how a clear data strategy is linked to strong financial performance, but the research also reveals that more can be done and significant challenges still remain. Respondents held a variety of positions from managers and departmental heads, all the way up to director level and C-Suite.